Once on the tongue, this is more than a light stinging away in the nose and he presents quite well matched flavors. A Glen -...? Rather not. Although ... no, rather not. Or? At first quite intense alcohol in the nose. He probably needs some more time in the glass. Now a trace of mild smoke ... Or a torn match? Difficult to estimate. Then come oranges and figs, something mineral, salt, pepper, Maggiwürze. Slightly musty. Pleasantly strong and warming in the beginning, spicy and with sweetness of red grapes. Dry, oaky, a hint of age oak cabinet muff. The sweetness will be more intense, oranges will come. Nougat chocolate, almonds, hazelnuts. Again, the Maggi wort. After a while on the tongue, the variety of flavors increases significantly. Medium long and very dry. Oak spice, pepper, bitter orange marmalade, nougat chocolate. The first Woodsmoked where the smoke jumps right in my face. Great combination as heavy sweetness and the spicy bitter notes of the coniferous forest fire. at Glen Els I'm getting the text out ... delicious, ham'se again made good. This is clearly not a Scot, which is not so bad, at least on its own, to a pronounced herbal note with a hint of smoke, quite delicious, but unfortunately also somewhat artificial and constructed. 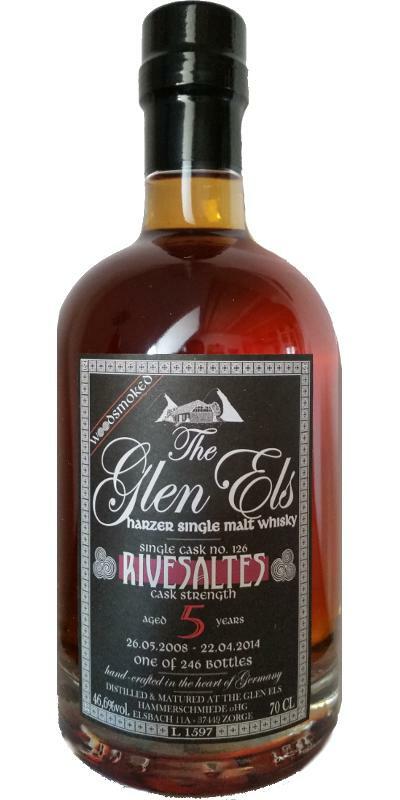 not as sweet as many Glen Els, so one of the good ones. I like it a lot and it's a great interpretation of whisky. Still very barreled, but not overwhelming. Here it is clear that it is not a Scot. the smoke is too much smoke and too little peat. In addition a strong bite alcohol, then a lot of fruit, sweet and chocolaty, accompanied by some campfire. beautiful wood smoke, lots of Fricht, but also a nice mineral side, with nougat. The departure is quite short.